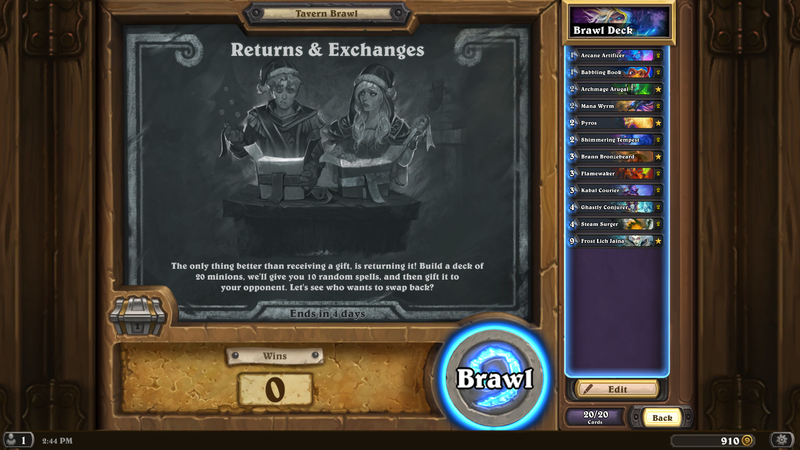 This week’s Tavern Brawl is a new one just in time for Winter’s Veil: Returns & Exchanges. Simply build a deck of 20 minions, and they will add 10 random spells, then “gift it” to your opponent. I totally did this wrong. I though they were only giving the spells for some reason, so I made a pretty good deck. 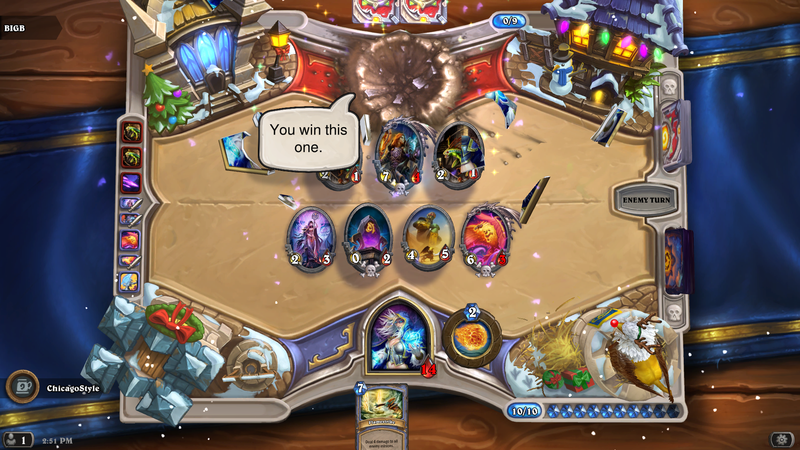 I went up vs another mage too, so you can imagine how much that sucked. Early on anyways. You also only start with 20 health for some reason. I got lucky, and was able to swap my deck back. There is one of those “swap” your deck back cards. Which was nice. I’m not too sure if I will play this again. I might just for giggles. You get a card back instead of a free pack, but that’s all good because there is a quest out there: Play 100 cards, and get 4 free packs from the current expansion. So that’s cool. 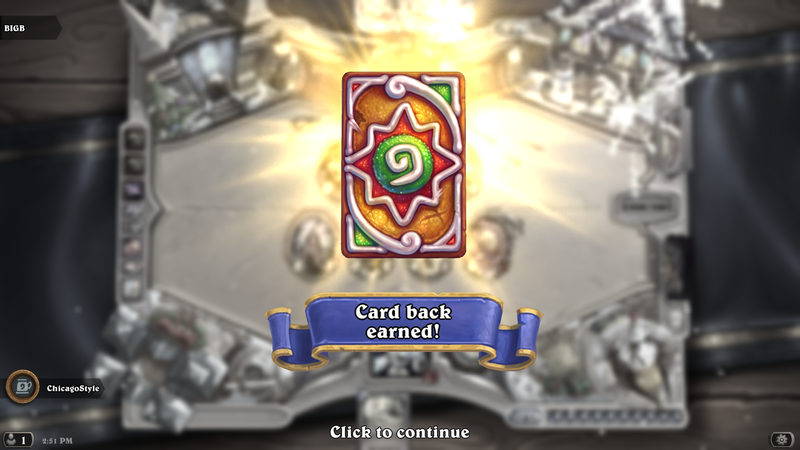 So get in there, get your cardback, and have some fun. I’ll see you next week for the last “Brawl of the Week” of 2018! 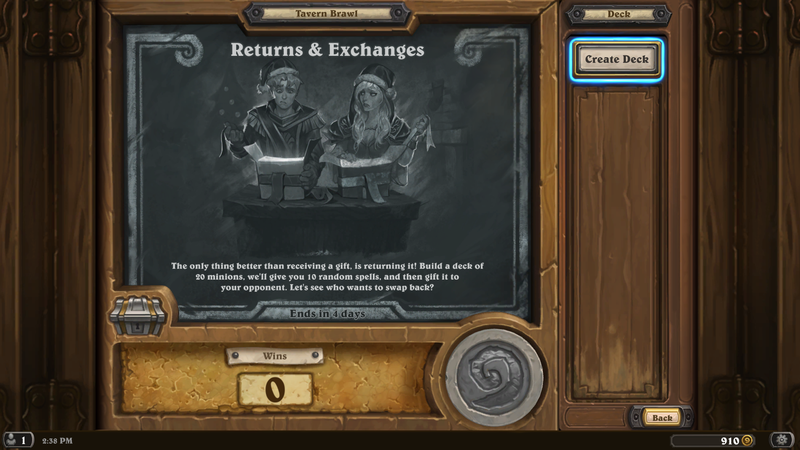 This entry was posted in Hearthstone and tagged Brawl of the week, Hearthstone, Returns & Exchanges, Tavern Brawl. Bookmark the permalink.